Driving home from work today, I noticed several signs posted at different intersections for a “Helicopter Egg Drop.” This isn’t the first time I’ve seen these signs in the past few years. Helicopters are noisy and interesting; they make me think of emergencies, SWAT teams, and money. I get a nervous Nine-Eleven feeling in my stomach when I hear one. This “egg drop” is sponsored by a local church which meets in a movie theater. Tens of thousands of plastic eggs are dropped from a helicopter into a field and children run through the field, picking up the eggs in their Easter baskets. The plastic eggs are filled with candy and prizes. I’ve never been to a church which meets in a movie theater and drops eggs from helicopters, although their website says they are a “church you will be proud to invite your friends to.” I wonder what happens to all the plastic eggs that aren’t found. I wonder how much it costs to rent a helicopter for an egg drop. Occasionally, Federal Reserve Chairman Ben Shalom Bernanke is called “Helicopter Ben.” He once referenced another economist, Milton Friedman, when he spoke about inflation and deflation and since that speech, pundits have applied the flying appellation to Mr. Bernanke. Mr. Friedman’s idea was that a central bank could hypothetically control inflation by dropping money from helicopters. The central banking system of the United States, The Federal Reserve Bank, has never literally dropped paper money or plastic eggs from helicopters; they are able to stimulate the money supply in other ways. A true “helicopter miracle” remains a hypothetical event. These eggs were not dropped from a helicopter. Egg shells contain a variety of soil enriching minerals like calcium, which helps prevent blossom end rot in tomatoes and peppers. Egg shells are also good pest deterrents; to a slug, egg shells are like broken glass. Sprinkle some shells around spinach and lettuce as a preventive measure. 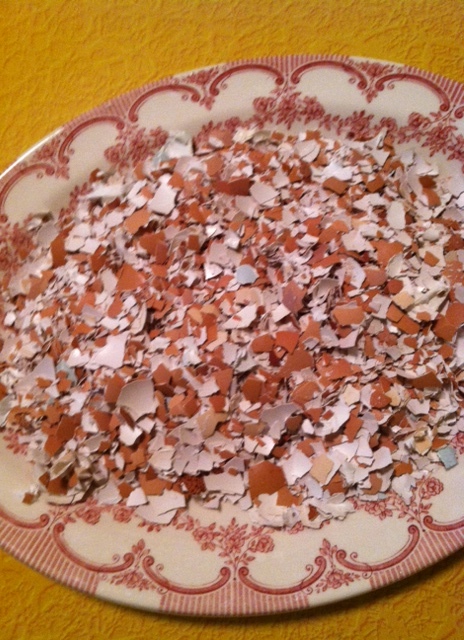 I’m going to continue saving egg shells for my summer garden but I’m not going to pick up any plastic eggs. I don’t think they grind up well and I don’t know if they will keep slugs away from my lettuce. Today is Good Friday, the day cultural Christendom commemorates the crucifixion of Jesus Christ. Traditionally, the New York Stock Exchange (NYSE) is closed on Good Friday and while there are a number of theories why, no one knows for sure. Traditions are like that; there is a good reason for them one day and a hundred years later, no one remembers it. The Federal Reserve Banks will be open today, though, so there is a chance there could be a helicopter miracle. Which would you prefer they drop, dollar bills or plastic eggs filled with candy and prizes? Aside | This entry was posted in Friday Pillow Talk and tagged Ben Shalom Bernanke, egg shells in the garden, Federal Reserve Bank, Good Friday, Helicopters, Milton Friedman, random thoughts about eggs and helicopters. Bookmark the permalink. 1 Response to And What of Helicopters? http://www.youtube.com/watch?v=_8Pz_d_BCiU Such an eerie quality, clearly recorded while she played while sitting on her wooden floor.